Willow Smith, 17, was seen departing the George V Hotel in Paris, wearing an all black vest over a black sheer skirt. Earlier she attended the Dior runway show. Willow was named as the new face of Chanel in 2016. Her brother, Jaden Smith, was named as the face of Louis Vuitton in 2017. Tina Green, mother of heiress Chloe Green, center, and ex-con-turned-model Jeremy Meeks were spotted attending a fashion event in Paris during Paris Fashion Week on Sunday. Did Willow and her brother ever complete HS? I want Willow to pull through so bad....she is gorgeous! that eyeliner is a no, she shoud have just kept it on her water/lash line. I'm loving Rita Ora's poncho, and that Jeremy Meeks pimp game is much respected he got the mother going along with his pimping. Willow is so stunning, just like her mom. As for Jeremy, he looks hurt behind those eyes, smh. she has model potential, remember those vogue pictures a few years back..she was on point in those. Oh so Chloe's mama look like a Muppet too. Got it. Jeremy n his coven of witches...?? They all look a mess! Yes, she is. Absolutely gorgeous. Jeremy is Trash...Willow: due to lack of education too much money and too much freedom will be a Sneaky drug addicted mess real soon. What does she have to look forward too? Rita is Rita! Ok, she’s still a child so I’m not going to say anything bad about her. I guess we all have our opinion about what’s gorgeous and what’s not. He only 25% black so hes right at home. 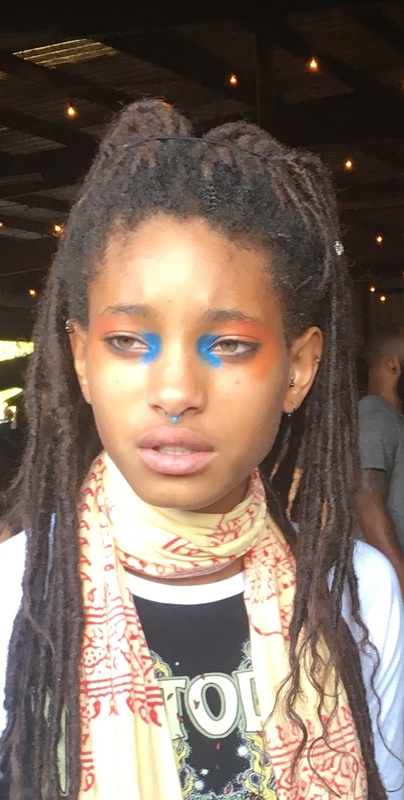 If Willow toned down the craziness and ate a few good meals vs. the vegan ish her parents got her on she'd be quite the stunner. She has a cute face and everything about her frame screams model to me. Its really sad when know they fkd up so badly there's turning back or righting the wrong. His wife will take him back. But it will take years of recovery to get their trust and family vibe back. That 25% is strong though..... he’s holding true to what a 100% niccas do on the daily, for a whoooole lot less!!! See: Fetty Wap; Antonio Cromratie (sp); Wayne etc.????? Uh-oh Jeremy, has that Chris from "Get Out" aka Kanye medicated look in his eyes. Or is he trying to give the cameraman the same come hither look he used to hook Chole??? Willow and her talented brother Jaden were both home schooled. He's trying but look at her and her mama with the laser c*ckblocking stares. He's caught. Karl Lagerfeld is so much uglier... inside and out! Those of us who are from Great Britain appreciate her talent. ? I would never take a man back if he did something like that.